A beautiful rare The People 1950s Dress Pattern, style number 348. 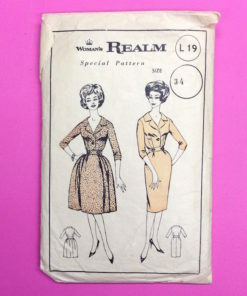 This pattern dates to the early 1950s. The back of the pattern gives instructions on how to make the dress and the materials required. The rest of the instructions are on the inside of the packet. There are 12 pieces in the pattern in total, as well as instructions for how to create the items. Sizing: The sizing on the package says 40, making it around a modern-day UK size 16 – or 40″ bust. Condition: Almost new; complete, pattern pieces uncut and in excellent condition. Packet shows a little wear along the bottom as expected with age.